QUESTION: at $40,488 a year how many NDIS properties do you need to replace your income? The Government is strategically overpaying on rents to stimulate private investment… and it’s working. * The devil is in the detail. Learn the secret to collecting the maximum rent from the $700 million NDIS Program. To maximize your rent you need these elements. Miss 3 of them and you get no NDIS rents. Miss 2 of them and you could get just a fraction of what’s possible. When you have your property near 3 others your risks are LOWER. When we can share staff and resources between houses your tenants get better care. “The National Disability Insurance Scheme (NDIS) is the single biggest opportunity to stop young people going into aged care, and to get those currently in aged care into more appropriate housing. "My interests are directly in line with your interests. We are looking for investors to build the properties we need, to grow our care business." You need a care provider who is committed to keeping your property full. We operate with groups of houses to get economies of scale, so that is exactly our agenda. Some of the big charities are care providers but their goal isn’t to run profitable group homes. Their objective is charitable, and that is wonderful and I am really glad these organizations exist. However, that means that they may just put one tenant in a property because it’s a family and one of the parents acquired an injury and obviously they want to live together with their kids so they put them into a NDIS home. We can’t afford to run that kind of a model, there’s no scale in that and that’s why charities, who operate off donations and not just the NDIS allowances from the government, can afford to do houses like that. I’m really thankful they are doing this work, it’s spectacular, but that’s not something we can afford to do when our income is from providing the care. We need the scale and we need multiple group homes. A single family in a single home is simply a model we cannot make work with the allowances the government pays. So as you can see very clearly, my interests align with your interests. Where are these extra participants coming from? Many of the people this program is designed to service are living at home with their parents so they aren’t in the system at all. The problem the government sees coming is that these parents are aging and the day is coming where they can’t look after their children anymore, so we as a nation are getting ready for this. Clearly, this is a massive social welfare program for very vulnerable people. This is a long term problem and the government is implementing a long term, and we believe very strategic solution, to meet this need. This extract from the federal government briefing document to investors, is about as clear as any government department can say “we think we’re getting a bargain”. Is SDA funding here to stay? Yes. SDA funding under the NDIS is a legislated commitment of Australia’s Commonwealth, State and Territory governments, set out in the NDIS SDA Rules (2016) under the NDIS Act (2013). This legislation provides the foundation for government’s long-term and firm commitment to SDA funding under the NDIS. Beyond the legislative commitment, SDA funding enables eligible participants to achieve better outcomes while representing value for money for the NDIS. This is due to high-quality fit-for-purpose dwellings making it easier and less expensive to provide the range of person-to-person supports that SDA eligible participants require. Broad benefits to all parties including participants, providers and the NDIS underpin the long-term commitment to SDA funding. Which Option Do Think Saves Money? This is an obvious example that “fit-for-purpose” dwellings are much cheaper than hospital rooms. If the Park Hyatt Hotel was offered as a money saving alternative to St Vincent’s Hospital by a health insurer, that tells you a lot about the cost of a hospital room. Hospital rooms need to be setup for every possible situation so the majority of features aren’t used by most patients… but you pay for them anyway. Fit-for-purpose dwellings ONLY need the services for their purpose so they are an obvious and easy way to save money. This is why the NDIS sees the the SDA housing as representing “value for money”. This is a massive money saver for the government. Additionally, because the tenants are appropriate accommodation they are able to take on more of their own care. This means less hours of carer time is needed which again saves the government more money. This also means that care can now be delivered less expensively because it is not delivered by highly trained nurses. 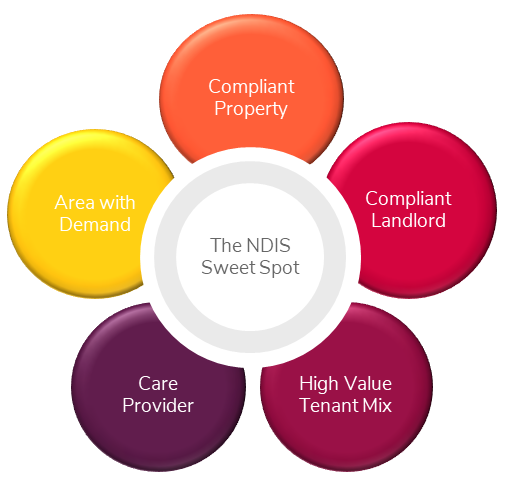 Your NDIS tenants don’t need nursing care, they just need help navigating certain areas of life. The people delivering the care have a lower hourly rate than nurses so this program saves the government money. "If the building can’t be used for anything else, who is going to buy it in the future? How are you going to sell it and get your profits?"